This recipe gets 5 stars for balance of ingredients and flavor... but gets 3 stars for instructions. The ingredients balance well, and the meatballs have a great taste. There are a few things I experimented with to improve this recipe. First, I reduced the salt, and used garlic powder (not garlic salt). I also did not dice the onion, I grated the onion on a small grater, and grated it over the bowl, so the onion juices blended into the meatballs, and you're not left with large bits of onion. One of the biggest steps is to combine all the ingredients EXCEPT the beef, and allow this mixture to sit for 5 minute before including the beef. This way, the bread crumbs absorb the moisture of the milk and the flavors blend. Once you're ready to mix the beef in, use only your fingertips, and blend gently being careful not to over-blend. 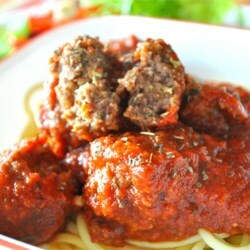 Taking this step, you create a more moist, light and delicate meatball. The instructions as written in this recipe will likely cause the meatball to get dry, dense, and hard. Again, delicious balance of flavors, but the method of mixing the meatballs is not the best.